In my version I have kept faith with the ingredients but altered the method by pre-roasting the tomatoes to concentrate the flavour and I have pre-cooked the pastry base to ensure crispness. This recipe can be made as one large tart or 4 – 6 small ones depending on appetites and preferences. The flavours and textures of this tart are delicious – a creamy base of crisp pastry smothered with a paste of ground nuts and coconut milk flavoured with ground cumin, coriander and saffron. Next a layer of caramelised onions flavoured with tamarind topped with semi dried tomatoes. My version is vegetarian and not vegan, as Meera’s was. Preheat the oven to 200C/400F/gas 6. Swirl a drizzle of oil in a large frying pan on a medium heat and add the onions. Cook for about 15 minutes, stirring occasionally, until soft, and caramelised. Add a pinch of salt and stir in 1 tsp tamarind paste and taste. (The tamarind paste I bought from an Asian shop was quite concentrated. So add this cautiously tasting while you do.) Set aside the onions. Place the cut tomatoes on a baking sheet, grind some salt over them, and place in the oven to cook for 15 minutes. Keep an eye on them to ensure they don’t burn or dry out too much. Prepare the pastry base for the tart. Either keep the base of the tart the same size as the sheet of pastry or cut into six pieces. Lay the pastry sheet/pieces flat on the work surface and with a small knife, score a line all around the pastry 1cm away from the edge. Please the pastry on baking paper. Brush with beaten egg. Place in the oven and cook for about 12 minutes or until the pastry is risen and turning golden brown. Leave them on the baking sheet while you prepare the filling. If the centre of the pastry puffs up too much just pierce with the point of the knife to let any steam out and gently flatten with your fingers. Place the nuts, spices, saffron, garlic and a pinch of salt into a food processor and add 200 mls of coconut milk. Process until you have created a smooth paste. It should be spreadable and the consistency of thick cream. 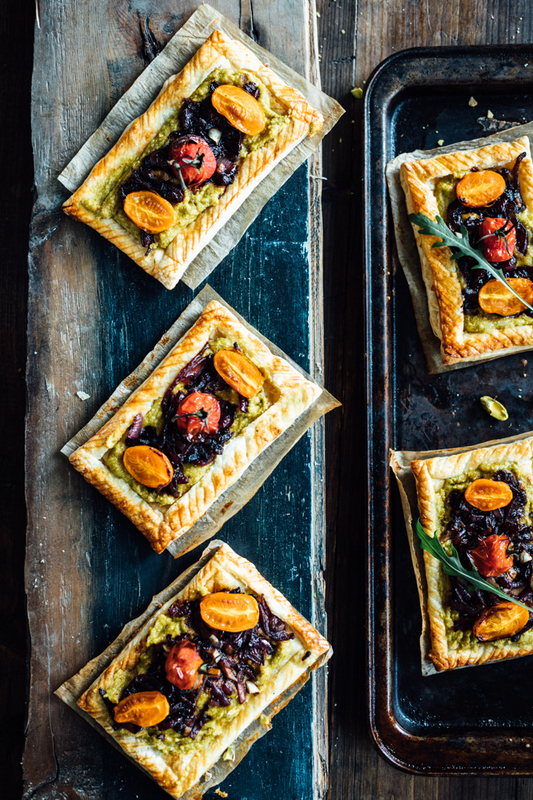 To build the tarts, spread the pistachio paste evenly over the pre-cooked pastry and then spread the caramelised onion and tamarind mix over the nut paste. Finally lay the tomato halves cut side up on top. Bake for a further 15 minutes or until the pastry edges look golden, well risen and crisp. Serve with a crunchy mixed salad or simply a green salad.